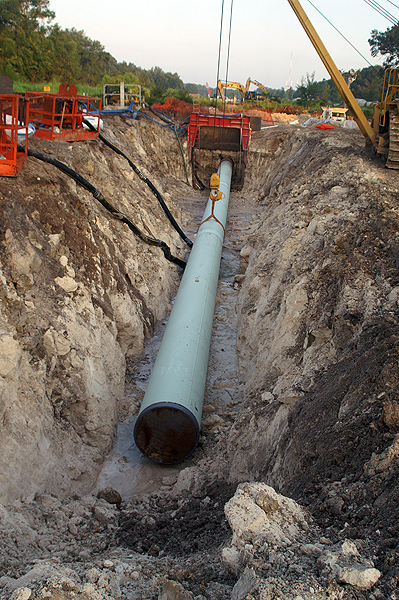 One of the hardest things about putting a pipeline through Florida is the high groundwater table. There are Federal rules on how deep the trench has to be. In the case of this bore under a railroad track, the trench intersected an underground water flow, which caused a spring in the middle of the trench. The hoses from two large pumps are placed in the flow to try to keep the trench dry. The water is pumped into a settling area where it is filtered prior to flowing into a wetland. This entry was posted on Sunday, June 10th, 2012 at 9:38 am. It is filed under Corporate, Education, Landscape, New Images and tagged with groundwater, pipeline, pump, right of way, trench, water. You can follow any responses to this entry through the RSS 2.0 feed.